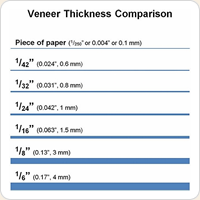 Our veneers are raw, unspliced, not backed or prefinished. Photos are representations only - please contact us for specific availability. Widths and lengths vary just as individual logs vary. Lengths are represented as SHORTS (3 ft. long or less), FURNITURE LENGTH (3-8 ft. long), and PANEL LENGTH (8 ft. or longer). Prices are per square foot and subject to our discounts. Please call us to place an order - only requests for information can be submitted online. Please read the "Ordering" section below before placing your order. We accept written, FAX or phone orders. Payments are by money order, check, VISA, Discover, MasterCard, or American Express. You may obtain quotes, send or receive photos or correspond with us via e-mail, but do not e-mail orders with credit card numbers. When inquiring about a specific item from the website, please note the ENTIRE product code of the item. For example: WS M ANIGRE 501 (not just the number 501). This will help the sales team know exactly which veneer you are referring to. Open accounts are available to qualified, regular customers. Ask our credit department for an application. Prices and inventory subject to change without notice! Handling Fee: $10.00 on all orders (other charges may apply). Orders shipped to addresses other than within the contiguous U.S. are shipped FOB East Aurora, New York in addition to the $10.00 handling fee. Check with us for charges on orders outside the contiguous U.S., or use your VISA, Discover, American Express or MasterCard for freight costs. 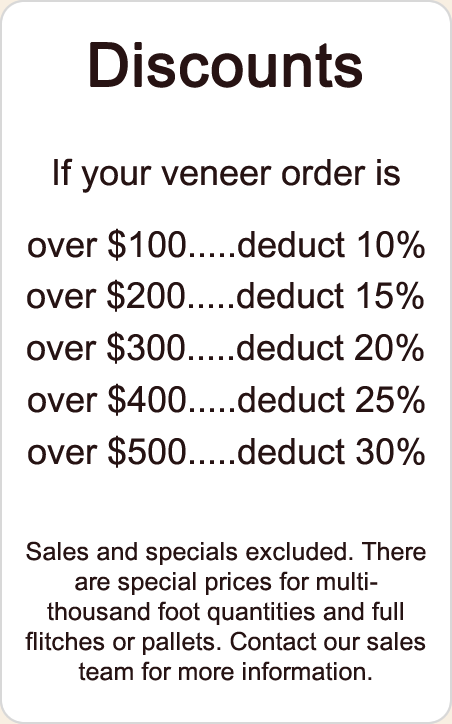 Special thickness veneers are shipped at customer's expense in addition to the $10.00 handling fee. Burl, stump, crotch, swirl and end grain veneers, which cannot be rolled and packaged in a standard box, are shipped in a "flat" package at customer's expense in addition to the $10.00 handling fee. Special Packages (Domestic, Exotic and Marquetarian Packages; Skateboard Veneer Sets; Veneer Sample Packs; Veneers in Presentation Collections; books and veneer tape) are shipped at customer's expense in addition to the $10.00 handling fee. Oversize packages are shipped at customer's expense in addition to the $10.00 handling fee. Express services are available at customer's expense. Full crates of veneer are shipped via common carrier, freight collect. COD Charge: $13.50. There is no COD service to Canada or other foreign countries. We strive for complete customer satisfaction. If your order does not meet your expectations, please return your order in its entirety and original condition within 20 days. We will exchange it or credit your account. NO returns accepted after 20 days! We do not refund shipping. Any materials being returned must be securely packaged and taped. A copy of the sales receipt or invoice with a request for exchange or credit must be enclosed. You may ship the package insured and prepaid via UPS, FedEx or US mail. Uninsured returns may result in loss of value due to damage in return shipment. Wood is a natural product with many complex and varied properties. The customer assumes full liability for all conditions arising out of the use of our products and is responsible for knowing these properties and their impact before ordering. Photographs are representations only. The actual wood has natural variations. Under no circumstances will Certainly Wood be liable to any party for any direct, indirect, special, incidental, consequential or other damages based on any use of any of our products, including, but not limited to, lost profits or business interruption even if Certainly Wood has been specially advised of the possibility of such damages. Certainly Wood shall not be liable in any way and assumes no responsibility for the final suitability of our products for any intended purpose, nor for any health conditions or accidents that arise during use of our woods. MSDS sheet available upon request or on our Downloads page.